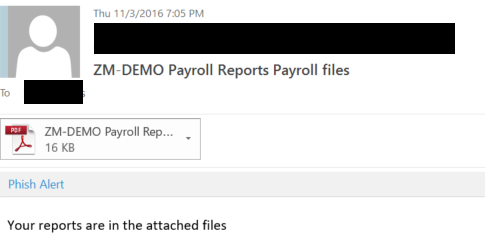 If you prefer, ASAP can send PDF copies of your payroll reports directly to your inbox. Please contact your account manager to discuss. a. Set up a folder & Rules : we all have crowded inboxes; we suggest you create a sub-folder to your InBox along with a rule to auto-move emails from ASAP into the "payroll reports" folder you create. - See these user guides covering how to set up folders, rules or filters w/ Outlook, Gmail, and YahooMail. b. Understand Quarantine: unfortunately auto-emailed reports tend to get caught up in the quarantine filters of various email hosts. - If you have an internal or outsourced IT team, please ask them to keep an eye out for these files. If they have questions, we would be happy to talk to your IT administrators directly to help them understand the types of files and method of delivery, etc. - If you manage your own IT, then you might need learn how your email provider flags, manages and releases quarantined messages. Here are help articles on the subject for Office365 & G Suite/Gmail. Security Limitation: emailed PDF attachment may contain a password to open the file, but please understand that level of security is not sufficient alone. Therefore, ASAP will not send PDF files as a standard attachment to you if the file contains personally identifiable information (PII). For this reason we recommend relying on the Client Portal as a preferred delivery method. The Client Portal will still notify you every time a file is saved.